When Grandma tells Ava about the time she was chased by a leopard, Ava is a bit scared. But when Ava tells her little sister Elise the story, Elise is petrified! The following day, Elise thinks she can see leopards everywhere. Frightened of being gobbled up, she hides in a cupboard. Can Ava and Grandma save the day? 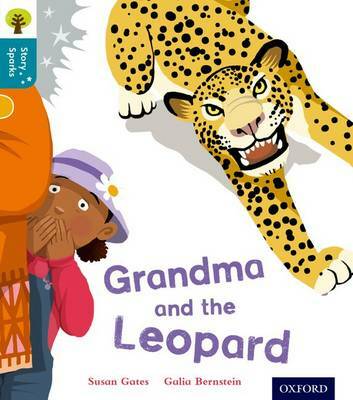 Grandma and the Leopard is a beautifully-illustrated story about sisters and vivid imaginations! Oxford Reading Tree Story Sparks is an emotionally-engaging fiction series that will fire children's imaginations. These 36 original stories will get children thinking, and develop and deepen their comprehension skills. The variety of authors and illustration styles broadens children's reading experience, with something to appeal to every child. All the books in the series are carefully levelled, so it's easy to match every child to the right book for them. They also contain inside cover notes, to enable parents and teachers to support children in their reading. Help with children's reading development is also available at www.oxfordowl.co.uk.